This report investigates the relationship of the land rent share of GDP with economic growth. Since the Second World War, there has been a negative correlation between Australia’s total land price and the rate of economic growth. The public narrative focuses on wages losing out to the income flows to capital. Our analysis demonstrates how rapidly rising land prices have ‘squeezed’ both labour and capital. Land reform is the key component to a fairer and smoother rate of growth, one where those at the lower end of the economic spectrum become key drivers of the economy. Australia’s valuation of land as a separate asset class is globally unique. Because of this, the impact of land prices on the economic cycle is often underplayed. With land becoming increasingly commodified, the findings of the report are timely. The economic rent of land has increased from 2% of GDP in the early 1950s to more than 20% of GDP in 2017. The “Global Financial Crisis” in 2008 and the recession of the early 1990s were preceded by notable squeezes on the percentage of GDP accruing to labour and capital, as distinct from land. An increase in land rent of 1% of GDP corresponds to a loss of 0.124% per annum in GDP growth. According to these correlations, the gains of landowners do not “trickle down” to labour and capital. 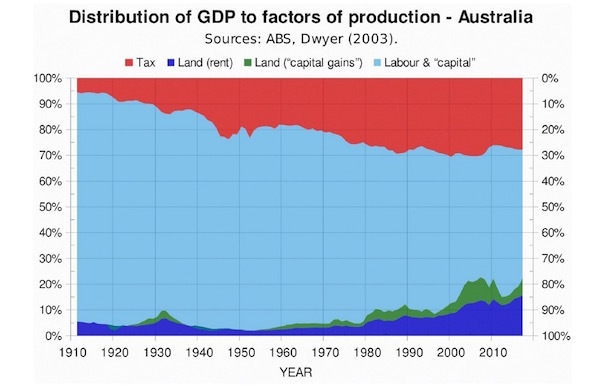 On the contrary, there is a “trickle-up” effect: when labour and capital get a greater fraction of GDP, growth is faster, and the cumulative effect of that growth will eventually make landowners better off in absolute terms, although not in relative terms. Since 2003, the economic rent of land has consistently exceeded 15% of GDP. The extraction of this economic rent, no less than the extraction of taxes, is a drain on the capacity of workers and employers to invest in future growth. Taxes that improve the competitive position of tenants and land buyers relative to landlords and sellers — such as land-value taxes, and vacancy taxes (applicable to both bare land and vacant accommodation) — have negative deadweight. In order to maximize growth, we must minimize rent extraction by maximizing the bargaining power of labour and capital relative to land. Support the Prosper Australia Research Institute with a tax-deductible donation.